"James Siegfried (born April 20, 1953) hails from Milwaukee, WI. James was trained on piano from age seven and by his late teens, wound up studying music at a conservatory. His wild keyboard style (informed by dissonant modernists Thelonius Monk and Cecil Taylor) alienated his more conventionally minded instructors. After about a year at school he began blowing saxophone -- a progression inspired by the savage, screaming bathos of Albert Ayler, the subtler bop phrasing of Art Pepper, Lester Young and Charlie Parker as well as the gutbucket funk of Maceo Parker, Fela and various bar-walking R+B honkers. A few years later, the fledgling musical malcontent ditched his studies and joining up with a Velvets/Stooges-style proto-punk band called Death, before splitting to New York City in an attempt to crash the thriving underground jazz loft scene. When James hit NYC in 1976, he was not as well accepted as he'd hoped. Maybe the confrontational outbursts of this overly aggressive upstart were a bit too extreme for the intellectual chin-scratchers in the audience. Maybe his playing was too blatantly raw, unhoned and chaotic for the competitive, dues-minded musicians. Maybe the fact that some bizarre, scrawny white kid from the Midwest was trying his damnedest to infiltrate a predominantly black-identified cultural scene spelled disaster. This lack of welcome possibly embittered James -- in the following few years the issue of race would be unflinchingly referenced (along with plenty of other topics) in interviews as well as on his albums. Obviously James' quixotic energy hit a nerve with a small faction of the jazz contingent, because established players like Bern Nix, Luther Thomas, Joseph Bowie and Henry Threadgill would all eventually pass through the ranks of his various ensembles. Bloodied but unbowed, James hunkered down and studied his saxophone with another young firebrand named David Murray (who would later ascend to the top of the heap of recognition in the jazz world). Rethinking his approach, James started making the rounds at skuzzy downtown rock clubs like CBGB's. The early punk scene was well in progress, typified by such legendary bands as The Ramones, Suicide and Television. James Siegfried soon made the acquaintance of an equally misanthropic 16 year-old cocktail waitress and renegade from Rochester, NY named Lydia Koch. At some point soon after, the dynamic duo took on the pseudonymous surnames of Chance and Lunch, and the rest is history. A brief black and white movie clip from early 1977 of the two pre-cool icons can be seen in a rare documentary called 'Punking Out': A mute, painfully shy James grins goofily at the camera through huge, dorky glasses while chipper young Lydia, complete with feathered hair, giggles enthusiastically about serving up the Dead Boys her used maxi-pad! One band from the Max's Kansas City/CBGB's scene that took an increasingly left of center approach was the band China, who would re-christen themselves Mars by the summer of 1977. The group consisted of four enthusiastically non-musical artist-types who took the Warhol/beatnik/Velvet Underground aesthetic and started steadily dismantling it even further, breaking their rock songs down into sheer noise. Mars began sharing rehearsal space with like-minded rock weirdos like The Cramps and a newly formed group called Teenage Jesus and the Jerks. The early Teenage Jesus consisted of Lydia on guitar and vocals, James on saxophone, a Japanese guy named Reck on bass and Cleveland transplant Bradly Field on drum and cymbal. This initial line-up began playing out in mid-'77 and recorded three songs that would be released two years later by ZE Records. The music reflected a primitive but obviously disciplined approach to bludgeoning minimalism consisting of dissonant, pounding repetition and blankly cold shouting. Teenage Jesus pushed the nihilism of punk even further while completely circumventing the comforting rock and roll elements prevalent in most other bands at the time. Pretty soon, another group of inspired incompetents called DNA (a trio featuring Arto Lindsay and Ikue Mori) started practicing at the loft. Their own conception was based on deliberately skewed arrangements of brisk, lacerating noise and disorder. By the end of the year there seemed to be too many egos in Teenage Jesus and the Jerks -- James' sax squiggles were too extroverted for the increasingly monolithic and faceless thud of the Jerks, so James split off to form his own combo. A few people filed through the ranks before the group began to take its definitive shape. James Nares (who directed the hilarious and chaotic 1978 film Rome '78 which featured a cameo by James Chance as a lowly slave boy!) was drafted on guitar. Pat Place, a visual artist who came to New York from Chicago in 1975, wound up wrenching slippery guitar racket with a slide. Reck held the bass chair for a while, but was replaced in December 1977 by George Scott, a tall, lanky surf music aficionado from Iowa who had been gigging with a prototypical no wave band called Jack Ruby. Reck's friend Chiko Hige manned the drums for a spell before both of them decided to head back to Japan, later establishing the long-lived punk/no wave/new wave band Friction. James had been occasionally sitting in with a bar band of transplanted Kansas boys called the Loose Screws and wound up codging their drummer Don Christensen. By early 1978, Nares was replaced by another member of the Screws named Jody Harris. Adele Bertei, who came from Cleveland and had played in a band called Peter and the Wolves with the late Pere Ubu founder Peter Laughner, pounded away noisily on a cheap Acetone organ. The Contortions began developing a concept that fused brittle, jerky instrumental grooves with careening blasts of atonality. The rhythm section chugged away gratingly as if their prime directive was to substitute rusty razor blades for guitar picks and perform bizarro-world, amphetamine-jitter cover versions of The Meters songbook. Jody's clipped chicken scratch interlocked with George's brutally metallic bass tone and Don's odd, syncopated rhythm patterns to create a frantic foundation, both unnerving and danceable. Pat and Adele's contributions were more expressionistic and asymmetrical -- sharp fragments of sour, pungent sonic commentary filling the remainder of cracks in the sound. On top of the whole jagged musical puzzle James alternately screeched and crooned his own alienated, cynical lyrics or issued forth horrid torrents of saxophone glossolalia. Mr. Chance soon began turning his inner aggression directly towards the audience, issuing vitriolic verbal tirades or leaping into the crowd to smack some complacent bystander in the face. Confrontation became a regular part of the show, adding to the already violent sonic vibrations. During the spring of 1978, the Contortions notoriety increased steadily while opening up for bands like Suicide, Mars and The Cramps. A pivotal event took place between May 2-6, 1978 as the crème of the Manhattan art/punk/noise bands were presented in a series of concerts at the Soho based Artist's Space gallery. The line-up included The Contortions, DNA, Teenage Jesus, Mars, Theoretical Girls, Terminal, Tone Death, Daily Life, The Gynecologists and Boris Policeband. The press had begun to tag these loosely associated groups with the stylistic demarcation 'No Wave'. At one point in the set James turned his attention towards harassing some unidentified woman when noted rock critic Robert Christgau tried to intervene and cool things out. The scene quickly turned into a bona fide skirmish, James emerging with a cut eye for his trouble. Progressive muso Brian Eno happened to be slumming the downtown scene and caught these gigs. He wound up masterminding a series of recording sessions by the first four units to produce a compilation entitled No New York which was released in November 1978. Although it has become de rigueur for anyone discussing this album to complain about the somewhat flat and muddled recording quality, the Contortions four No New York cuts give ample insight to a raw, feral intensity that would be missing from the later releases. 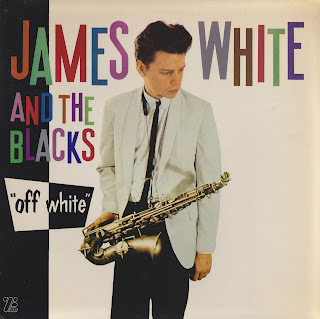 The first James White and the Blacks live show took place at Club 57 in New York City on Feb 2, 1979. Although the the Contortions were reaching their pinnacle of popularity in the New York club scene, James seemed to be making plenty of enemies -- for example, an anonymous saboteur ringed up the Village Voice (it wasn't anybody named 'Stella' however) and successfully instructed them to write 'cancelled' across the ad for the show. Local music rag New York Rocker began to document all of this interpersonal baggage as well as the increasingly outre and outspokenly negative behavior of James Chance. During the spring of 1979, several days of sessions for Buy would be recorded and abandoned - in print, James blamed the disaster on the incompetence of the musicians, while the band blamed it on James' technical ineptitude in the producer role. Emotions came to a head when James demanded that the rhythm tracks be re-cut again from scratch and Jody, Don and George decided to take a walk. The band reformed a few days later with Loose Screws/Chinese Puzzle bassist David Hofstra in lieu of George Scott. At this point, James and Anya demanded that the musicians sign a contract relegating them to 'sideman' status. This reconstituted line-up soldiered on and laid down the final tracks for the album. Meanwhile, George made himself busy by joining John Cale's touring ensemble, as documented on the 1979 live LP Sabotage. Buy is not considered by the members of the original line-up to be a definitive document (most significantly, Hofstra's neutral fretless bass tone is a far cry from the biting harshness of his predecessor's sound) cuts like 'Contort Yourself', 'Throw Me Away' and 'Bedroom Athlete' burn with plenty of real frenzy to spare. By the way, that's not Adele Bertei on organ (she was long gone by this point) but rather James himself torturing the keys here and there. 'Roving Eye' is a bonafide classic of white funk whiplash (it's hard to believe no one has sampled/stolen the main riff for some pre-fab dance or hip hop track!) Throughout the album, James' vocals set the mood, ranging from the utterly dispassionate to agonized fits of howling and screaming. Although the ragged freneticism of the Contortions live show is somewhat absent from this recording the rhythm section is certainly much better than serviceable and there's plenty of jagged glass guitar raking slathered all over the tracks. The Contortions embarked on a brief Midwest tour before jetting off to Europe in Spring '79 for what would turn out to be their final show: a single concert in Paris held outside in a tent. The performance approached near-riot status as a cadre of French Communists flung hails of bottles at the stage in protest of some rather indiscreet comments James had made in a local publication. Or maybe it was just a bunch of enthusiastic nihilists, responding in earnest to the Contortions' rumored violence? James and Anya wound up hanging out in France for a while, but the rest of the group were left to find their own way home. 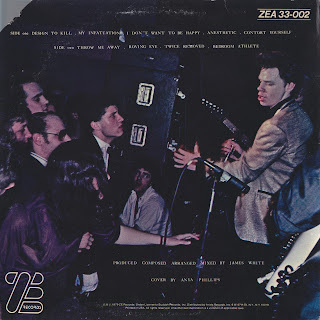 By Fall 1979, James Chance/White reappeared fronting an all-new Contortions line-up (featuring Kristian Hoffman on slide guitar and Bradly Field on, um, bongos) in what would soon turn into a rapidly revolving door policy for side persons. James continued to seek out side musicians with more professional chops to fulfill his desire for a slicker group with a faster learning curve. Off White hit the racks in Europe around mid-1979 and in the US later that year, while Buy saw release in September '79. Jody Harris, Don Christensen and George Scott joined up with multi-instrumentalist Pat Irwin towards the end of 1979 to form a modernistic neo-surf instrumental combo called The Raybeats. Jody also moonlighted in the Lizzy Mercier Descloux band as well as cutting a duo record with Robert Quine the following year. After a stint with Judy Nylon, Pat Place resurfaced in early 1980 with the urban dance/noise beat of Bush Tetras, which also briefly included Adele Bertei. George Scott went on to do double duty with The Raybeats and 8 Eyed Spy (also including Irwin and Lydia Lunch), before dying of a seemingly accidental drug overdose on August 5, 1980. Don Christensen made a few records in the early '80s under the moniker ImpLOG before going on to score cartoon soundtracks and working with Philip Glass. Jody Harris eventually played with John Zorn, The Golden Palominos, Syd Straw, Richard Hell, Kip Hanrahan, Matthew Sweet and others. Pat Place spent a few years in the mid-90s with a reincarnated Bush Tetras after having worked with people like Lydia Lunch and Maggie Estep. Out of nowhere in February 2001, the Contortions took the stage for two New York shows -- one at The Cooler and the other at Irving Plaza -- with a line-up including James, Jody, Pat and Don. By all reports, the playing was solid and large portions of the sets were dedicated to classic Contortions material. Don't get excited though! It doesn't seem like this brief reunion trip is going any further. Perhaps the revolutionary events of the past should remain in memory, colored vividly by the revisionism of history. People tend to change and most of the time (especially in rock and roll) scenarios resulting from bygone times, places and personal chemistries cannot be merely reenacted like a television show brought to us in progress after a lengthy news report. When most groups decide to reform, the audience usually expects the sublime but is often offered the ridiculous instead. The music of the original Contortions erupted from a New York City that was still exciting, dangerous and full of possibilities. Those halcyon days of artistic insanity are long gone but the musicians remain . . . James continues to refract various musical angles with several groups, Don and Pat have been playing together in in a trio with latter-day Bush Tetra Julia Murphy on bass, while Jody, Don and Dave Hofstra gig about once a month with a singer under the moniker The Band of George. Thanks to Pat Place, Don Christensen, James Nares, David Hofstra, David Siegfried, Glenn Branca, Mark Cunningham and James Chance for clarifying details." Ladies and gentlemen, for your listening pleasure, Contortions. Brilliant. James is still out there, getting it done, great as ever. But I love these first two records. Thanks for posting.